Traveling with kids on a long road trip can make even the most experienced parent a little nervous. You envision all the potential meltdowns, the numerous bathroom pit stops, and possibly losing your sanity as a parent. Taking several road trips with our children over the years, I can reassure you that it doesn't have to be the ride from you know where. The key to surviving and keeping your children happy throughout the drive is all in the planning and preparation of the trip. So get ready to make a list of everything you will need to pack and plan out in order to have the best chance of a fun filled and drama free road trip with your kids! What kind of snacks and drinks will I need for the trip? What are some easy and fun activities to put in the car? What are some other items my children use daily? After making this list of items, make two columns - one for items gathered up to pack and another one to check off that these items actually made it to the car. At times, my kids have been sneaky and grabbed an item out of the pile without my knowledge. The second column ensures all important items make it to the car to avoid any possibility of a meltdown and an unnecessary return trip home. You may be wondering exactly what kind of items you need to have in your car. I have provided a list of items with examples and those extra accessories you may need to bring on your road trip to keep your kids happy and well entertained while preparing for those unexpected moments that all of us parents enjoy so much. Snacks - Choose snacks that will not melt or spoil in the car. Have a good mixture of healthy choices and include a special snack for rewarding good behavior. Some good examples include crackers, chips, vanilla wafers, and fruit snacks. Cooler - A small insulated cooler filled with your child's favorite drinks is a necessity. Make sure to pack several juice boxes and small bottles of water. If you have room, snacks that might need cooler temperatures could be added to top. 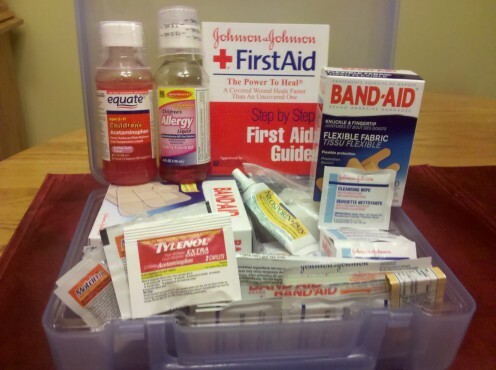 First Aid Kit - To deal with those unexpected emergencies, be sure to pack the first aid kit. Make sure it is filled with bandages, tape, fever reducer medicine, allergy medicine, and any other kind of medicine your family may need while you are traveling. 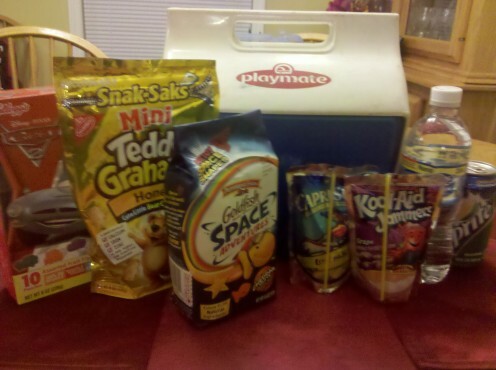 Entertainment - Pack a backpack or container full of fun activities for the car. 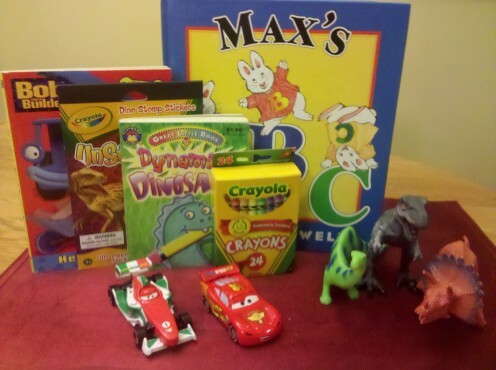 Some good examples are coloring books, crayons, small games, books, and any other small toys that your kids enjoy. Be sure not to pack toys with lots of small pieces to avoid losing them in the car. Electronics - A life saver to any road trip is the portable DVD player with lots of movie options. 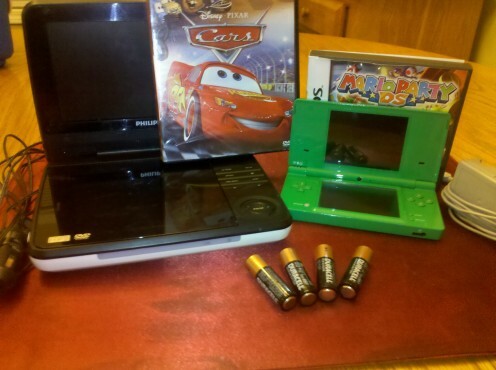 Other electronics to keep them occupied is a handheld gaming system, IPOD, Kindle, etc. Be sure to bring the chargers or extra batteries in case of power failure. Clothes - Have an extra set of clothes in the back seat in case of an emergency. These clothes will be useful in case of a spilled drink or bathroom emergency. Bring a shirt, pants, socks, and extra pair of underwear. Potty Seat - For potty training children, you may want to bring a potty seat for those unexpected, got to go now moments. There are times where an exit is not close so this is when the potty seat would come in handy. Clean Up Items - Avoid the messiness by bringing baby wipes or wet ones to wipe away the stickiness of hands and faces. You should also bring a small towel to clean up spilled drinks and a small bag to collect trash. Comfort Items - Don't forget the comfort items! Be sure to bring any special blankets, pillows, or stuffed animals your child may need to fall asleep. 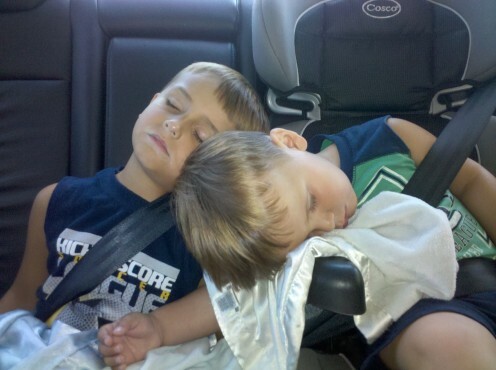 Naps are the best time of any road trip because it gives the parents that much needed to time to relax and recharge. What is your favorite game to play in the car? I Spy - A classic game to play with younger children is I Spy. If you don't remember how to play, you start off by saying "I spy with my little eye something insert color here". The kids have fun trying to guess what you spied. A-Z Letter Game - Another great game for little ones to play is the A-Z letter game. Pick a category and give an answer for each letter. For example, let's say the category is animals. You could say "A" is for alligator, "B" is for bear, and so on. License Plate Game - There are several versions to the license plate game. One is to find license plates that start with every letter of the alphabet. Another version is to make up phrases with three of the letters. For example, if the letters on the license plate were BAS, you could say "Boys Are Silly". A third way to play is to make a list of all the different state license plates that you see along the way. Internet Printables - You can find great kid friendly printables online to keep your children entertained. Print off tic-tac-toe boards, coloring pages, word searches, and cross word puzzles for a variety of activities to keep them busy. Sing Along - Have each child pick their favorite song and have a family sing along. Be sure to pack some kid friendly CDs or download their favorite songs to have a friendly singing competition. Travel Size Board Games - Try to find a travel size version of your favorite family board game. You can find many popular board games in the smaller travel size. Some good examples are Sorry, Trouble, Battleship, and Scrabble. Tip #1 - Complete all necessary car maintenance before you hit the road. It's always a good idea to get an oil change and have the tires checked before any major trip. Kids and car breakdowns are not a good combination so save yourself the trouble and take care of any important car issues. Tip #2- Pack your car wisely and make items easily accessible. Make sure the cooler is in a good position to be opened without much effort. Pack the toys and activities in a place where your children can reach them. If you have younger children, you may want to leave the snacks up front to ensure the kids don't eat them all within the first couple of hours. Tip #3- Print off a copy of Internet directions or keep a map in the car. Many parents rely heavily on their GPS to get them from point A to point B. This becomes a problem when the satellite signal goes out. Having a printed copy of the directions saves you from getting lost and helps to prevent a potential meltdown from the child that has been in the car too long. Tip #4 - Try to plan out your stops on the road trip if possible. Look for exits with restaurants such as McDonald's or Burger King which has a play area to let your kids get out all that built up energy. If you are stopping at a rest stop to have a picnic lunch, bring along a ball or other fun item to give them a chance to run around and have fun. As you can see, it takes a lot of preparation to be able to handle a road trip with your kids. The key to avoiding all the drama and the headache that comes along with it is to effectively plan out your trip. When you make the extra effort, you will be able to see the results of happy kids which in turn makes the trip that much more memorable. Are there going to be moments you are not prepared for? Yes. Consider it a learning experience and make a mental note of ways to avoid that mishap on the next road trip. Parenting is a daily adventure and we learn something new everyday. I hope this guide has helped you to effectively plan out your next road trip with your kids. Do you have any additional tips to achieving a successful road trip? Any funny memories or cringe worthy moments you want to share? Feel free to post your comments in the section provided below. You never know - your advice or story may help another parent out there! Happy travels to all! Find tips and advice on ways to have a great family vacation on a budget. 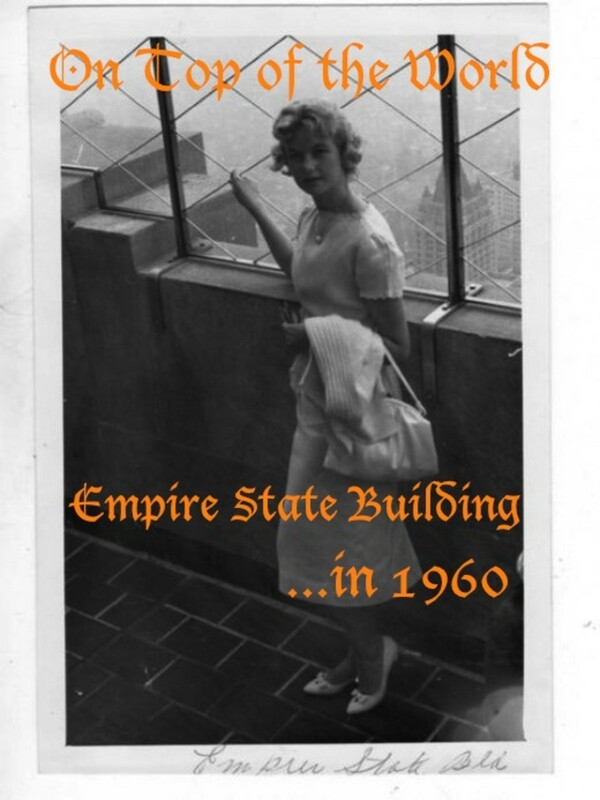 Includes money saving tips to help cut the costs of food, lodging, and travel expenses. Tips and advice on how to start living frugally using coupons. Learn the basics of couponing and how to start saving money on your grocery bill. After signing your child up for T-Ball or Coach Pitch, you may be wondering what kind of equipment your beginning ball player will need. Here is a helpful list to ensure a successful first ball season for your child. Prevention is key to keeping your children healthy and safe. Read this guide to find useful tips to lessen the chance of the most common kid injuries. Thanks so much ElleBee! You are so right about roadtrips yielding so many great memories. We are going on vacation next month and though I dread the thought of packing and driving, I know it will all be worth it in the end. Appreciate you stopping by and leaving your kind comments! This is an excellent hub! You managed to pack a lot of information in to one concise article. Roadtrips are so often dreaded, but they also can yield lots of great memories. Thanks igamemom! IPads are a great way to entertain the kids on a road trip and definitely can save some space in the backseat :) Appreciate you stopping by and commenting! Thanks so much Simone! Well I promise next road trip we will swing by and pick you up...hope you don't mind being squeezed in the backseat between two kid booster seats ;) Appreciate you stopping by and commenting! I bet road trips in your car are tons of fun! This is a BRILLIANT collection of tips. You remind me of the parents I would always want to ride with when my elementary school classes took parent-chauffeured field trips. Wow I forgot about punch bug! My sister and I use to play that all the time when we were little. Thanks for reminding me of that one. Appreciate you reading and commenting Teresa! Great guide. It is much easier traveling with my boys now that they are older;however, many of the tips still apply. When I was a kid we played punch bug. Every time we saw a VW Beetle we would 'punch' our sibling in the arm. Thanks so much! Oh my - major car problems would be my worst nightmare on a road trip. Good to hear that your kids were troopers. Fortunately we haven't had to deal with that one yet (knock on wood!) Appreciate you stopping by and for your comments! Excellent and thorough hub. Lots of great suggestions along with the checklist. My kids are awesome travelers but I also make sure that I have most of the things that you mentioned. We even had (major) car problems on our vacation last summer and my kids really were troopers. Nicely done! Thanks so much! That's the way we use to play with my parents when I was younger too. I should go back and add that one in there as well. Thanks for that reminder - appreciate you reading and commenting! Great tips! You thought of everything. The license plate game we play is to see how many different states we see, and make a list. Working together, of course, to prevent competition problems between my two! Thanks for sharing these very useful ideas for roadtrips. Thanks sankari! Happy to hear you found the tips useful. Appreciate you stopping by, commenting, and for the votes! Nice tips! I liked the collection of games you have listed. Your video was a good attempt and it gave a good highlight for the hub! Voted up USeful!